Inspired by the Emergency Medical Service (EMS) Systems Act of 1973, which sought to give all individuals equal access to emergency medical services, the first EMS Week was established in 1974, when President Gerald Ford declared a week in November to be "National Emergency Medical Services Week". Reestablished by The American College of Emergency Physicians in 1982, EMS Week was moved to October, then ten years later shifted to May in order to separate it from Fire Prevention Week. EMS workers show dedication to their communities through service, and are some of the first people to answer the call in times of distress. 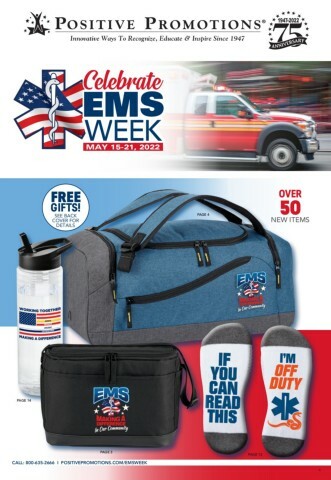 During EMS Week, recognize your EMS professionals for their caring and commitment, and say thanks with useful gifts of appreciation as well as practical items perfect for on shift and off. You'll find lunch bags, drinkware, tech products, T-shirts, and more exclusive gifts displaying recognition themes including EMS: Every Call Counts and EMS: Serving With Pride. EMS Week in May also offers a great opportunity to educate your community on emergency preparedness and the importance of safety. Host successful open houses with kits featuring popular items at special savings. Make your classroom visits memorable with Value Kits for grades K-6. These products offer great ways to teach kids about the vital role of EMS professionals and remind them to stay safe, from educational activities books and EMS helmets to bookmarks, stickers, pencils, tattoos, and more. You can also help prepare every family in the community for critical situations with first aid kids, emergency preparedness handouts, and other safety reminders. Build visibility even further by adding your name to many of our educational items and incentives. It’s an effective method of promoting your EMS services and the 9-1-1 system, boosting responder morale, and recruiting volunteers. Whatever EMS products you need, Positive Promotions is ready to help you honor your Emergency Medical Service team and promote safety awareness, during EMS Week and all year long.